In an unspecified time frame where beautiful young women listen to vinyl and read DRACULA comic books, Kendra Carelli, haunted by her parents’ murder and beset by nightmares of the masked killer, wins the coveted lead in her ballet school’s performance of “The Nutcracker”. 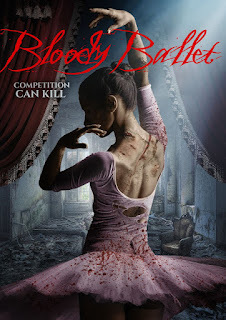 Professional insecurities, hallucinations and the obligatory scarred, creepy one-eyed peeping tom janitor abound when her fellow dancers start getting killed in gruesome ways. Set to a wonderfully evocative soundtrack heavily influenced by Morricone, Goblin and Rob, co-writer / cinematographer / director Brett Mullen’s feature debut is a visually stunning homage to classic Italian giallo (and the American slasher films that took their cues from their sexier, nastier European forebears). The narrative parallels to SUSPIRIA are reinforced by the gorgeous primary colour palette, while scenes of unclothed young women mutilated in genuinely vicious murder set pieces with bright red arterial spray evoke Argento in his prime. A wince-worthy straight razor ankle slashing and a notably graphic scene of ocular violation (all accomplished with terrific practical gore FX) ape the jarring viciousness of the films it imitates, as do the hallucinatory visuals and the creepy mise en scene (sinister dolls, narrative-specific music boxes). Carelli is terrific as the mentally fracturing heroine, while there are decent roles (for a change) for talented, older genre icons like Debbie Rochon and Caroline Williams. The (guessable) climactic revelation is achieved via a particularly startling gore scene – one of many highlights in this suspenseful, stylish love letter to an unforgettable period of horror history.